The iconic rhythm-and-blues singer Joy Ryder passed away a few minutes after midnight on Valentine's Day, in keeping with the hours she kept for the past 4 decades since her early days at CBGB at the beginning of the punk era, losing her battle with liver cancer caused by Hepatitis C.
Joy Ryder embodied the best of all possible styles ... 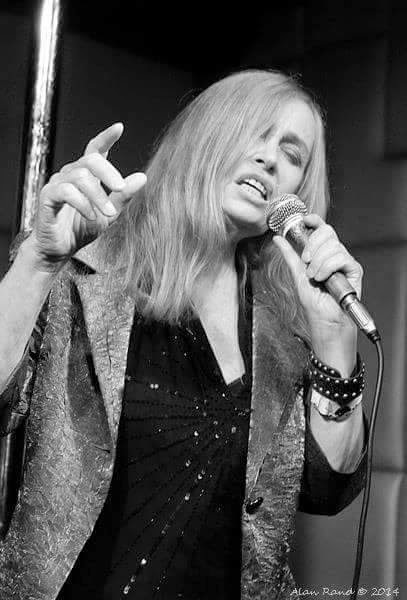 Although Ryder has been called a blues singer, she was a jack of all trades: jazz stylist, punk diva, and rock 'n' roll rabble rouser and deeply and widely loved by the whole of NY's musical community who are the poorer for her loss. Brooklyn-born Ryder (nee Denise Whelan) was the daughter of jazz singer and bassist Phil Whelan, who had a hit with the song "One Bourbon, One Scotch, One Beer" with his band The Five Encores. Her childhood was filled with her father's rehearsals and her own piano lessons from the age of four. I met Joy when she was 16 and I had just turned 17 on St Mark's Place and Second Avenue in front of Gem Spa in the fall of 1967. We both worked with Wavy Gravy and The Hog Farm performing at the Electric Circus, attended peace demonstrations, volunteered with The Yippies, UATWMF, and The Diggers. Joy also worked with Kusama, the famed avant-garde painter in her large-scale happenings. In 1968, after the summer of love, when the East Village was awash with pedophiles lured by the massive population of homeless teenagers and the flower power vibe changed to hard drugs and violence ushered by not only the murder of Linda and Groovy who we both knew and the brutal murder of another friend, a boy named Sunshine, who was beaten and burned alive, Joy decided to leave NY to study at the University of Hawaii. She started singing in bands that played local Army bases and then changed her name to Joy Ryder. She dropped out of the University of Hawaii, returning to NY and looked for singing work. She studied acting at the Lee Strasberg Institute, then at an audition, she met guitar player, Avis Davis and they started a band, The Davis/Ryder Band, and toured the underground rock circuit, opening for acts like the Ramones, John Cale and Iggy Pop. After recording their rock anthem "No More Nukes," they performed for a quarter of a million people at Battery Park City in 1979 with Jackson Browne, Bonnie Raitt, Crosby, Stills and Nash, and others. In 1980, Joy moved to Berlin to work with underground theatre director Tony Ingrassia, where she appeared in films, plays and had several mainstream recording contracts with RCA, Polydor, CBS and Mercury Records. Since the late 1980s Joy made her home on Staten Island and was a much beloved figure in the NY music scene known for her generosity, kindness and sweetness. She is survived by her son Jessie Franklin of Staten Island. Joy's funeral is tomorrow (Saturday, Feb. 21) at 11 a.m. at All Angels' Church at Broadway and West 80th Street, where Joy sang in the gospel choir. In lieu of flowers, please consider donating to Joy's fund for medical and funeral expenses. Thank you, Penny, for this thoughtful summary of Joy's interesting life. Condolences to Joy's family, she led an amazing life and she will be missed. Rest in peace. I would like to highlight especially the line about her generosity, kindness and sweetness. That was so special and always so under acknowledged… and in people with this kind of talent, it becomes a sort of tragic flaw. I miss her presence. Everything about it. ooznozz sez: @ best she was an easy ryder with an "ease on down" credo and @ worst she was a breath of fresh air. Peacefulness always Denise. I played bass at age 17, in 1979, in Joey Miserable and the Worms at Studio 10 (hi Aron) and fell totally in love with Joy and Avis - she was so cool and wild and lovely. I remember her and Avis so clearly from then - remember watching them while eating peyote in a corner with Chris Whitley, another cancer victim. What a time, what talent. I miss her and will remember her forever.